Future Proof (2014) Average 4.12/5 - out of 6 total votes. 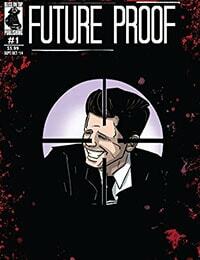 Future Proof is an on-going, bi-monthly series which follows two outcast agents who are recruited into a systematic one-way journey back through time where ultimately their actions allow for the most monumental events in history to take place. We jump right into the action as the two agents get caught up in the middle of one of the greatest conspiracies of all time - the Kennedy assassination. Any wrong move will change the future as we know it.